Multiple butternut cankers on a butternut tree trunk can girdle and kill the tree. What is butternut canker? Butternut canker is a fungal disease of Juglans cinerea, the butternut tree (also known as white walnut or oilnut). The disease is thought to have originated outside of the U.S. The first documented case of butternut canker in Wisconsin occurred in 1967. Butternut canker affects butternuts throughout their natural range (much of the eastern US), and has killed up to 80% of the butternut trees in some states. Although butternut canker can occur on saplings of black walnut (Juglans nigra), the effects of the disease on this species are minimal. What does butternut canker look like? Infected areas (called cankers) tend to be most noticeable on large branches or tree trunks, where long fissures in the bark form. Several cankers may grow together leading to bark that is distorted and has a mangled appearance. Smaller cankers also form around leaf or branch scars. These cankers are sunken and black, with white margins and folds of bark around the edge. 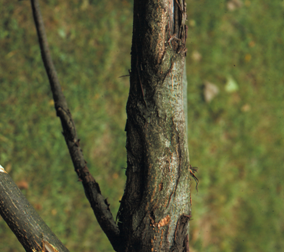 Cankers girdle branches and trunks, cutting off nutrients and water, leading to progressive dieback above the canker. Trunk cankers will eventually kill trees. A single trunk canker can kill a young sapling, while several cankers combined may be needed to kill an older tree. Where does butternut canker come from? Butternut canker is caused by the fungus Sirococcus clavigignenti-juglandacearum. Spores of the fungus are produced in cankers throughout the growing season and are spread from infected to healthy trees through rain-splash, insects, and wind. Wounds, as well as leaf and branch scars, often serve as points of entry for the fungus. Once a tree is infected, additional infections can occur as spores are washed by rain down to the main trunk of the tree. How do I save a tree with butternut canker? There is no cure (i.e., fungicide treatment) for butternut canker. Trees with trunk cankers will most likely die. If branch cankers are found early, removal of the affected branches can prevent the spread of the disease to other parts of the tree. 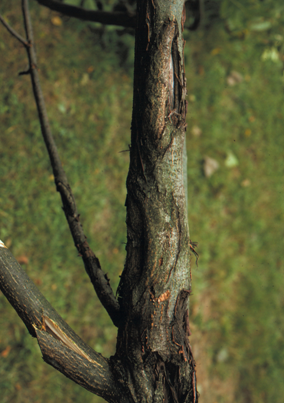 Prune out smaller branch cankers by cutting six to eight inches below the canker. Disinfect pruning tools after each cut by dipping them for at least 30 seconds in a 10% bleach solution or a 70% alcohol solution (spray disinfectants that contain at least 70% alcohol can also be used). How do I avoid problems with butternut canker in the future? There is little that you can do to prevent butternut canker. However, vigorously growing butternut trees are better able to slow the development of butternut canker, so make sure that trees are watered and fertilized properly. Established trees require approximately one inch of water per week. If natural rains do not provide this amount of water, consider applying supplemental water in the vicinity of the drip line of the tree using a drip or soaker hose. Fertilization of trees should be based on a soil nutrient test. If you live in a region where butternut canker is not currently present, or where there are few butternut trees, your butternut tree may be canker free indefinitely. If you live in a region where butternut canker is prevalent, watch for trees that are not affected by the disease. These trees may have inherent resistance. Consider collecting seed from such trees and growing saplings from the seed. At least some of these saplings will likely also have resistance to the disease.